This place is easy to access and conveniently located. You can walk to the beach and you are next to a coffee shop, bars, and restaurants. It is also close to shopping, parks, and the main road connecting Puerto Rico's northwest corridor. You will have easy access to the main tourist destinations in the northwest. Plus it has great access to Aguada, Moca, and other towns. Here are a couple of quotes from a guests: "Best of both worlds, a beautiful beach and pool at our finger tips; Close to beach, food and shopping. I especially like the feeling of mixing with the locals as opposed to being in the middle of a tourism hot spot." everything you could ask for and having a washer and dryer was an added convenience everything you want in a hotel plus you have a kitchen." You are dealing with honest owners, trusted members of the community. Also, secure payment options are available. I bought this place because I love spending the holidays in Puerto Rico. And this place is close to family and many attractions. I have been swimming in these waters all my life and I love it. I also love walking and running along the shore. You can wake up make some coffee and seat in the balcony overlooking the ocean, or you can walk down to the coffee shop and enjoy an early morning stroll on the boardwalk. If you want to cook great, if not walk to local eateries with Puerto Rican food, pizza, etc...Is it too hot? Then get in the pool or enjoy the ocean. It's truly a great location. You will enjoy it. View more about Saul Cordero, P.E. toilet, combination tub/shower, Amazing Ocean View from Shower! Aguadilla's town square is a 20 minutes walk, about a mile. Spectacular oceanfront views, you are just feet away from the water. You will love the sunsets and watching the pelicans fly while relaxing on the balconies or rooftop terrace. Split Units in each bedroom and living/dining room area. Two assigned spaces in controlled access parking. (2) Two tv sets: one in master and another in living room. Both have Dish Network. Two balconies and a huge (650 sqft) open terrace. All have ocean views, facing west, i.e., beautiful sunsets Outdoor chairs. Can’t beat the view. Older interior but very functional. Great view and location. Furniture and bedding were outdated and not the most comfortable but overall good value and very convenient . Owner was easy to communicate with. We have stayed here many times and always impressed with the views- ocean from every window. With the expansion of the malecon the noise can get very loud on the weekends and holidays. But during the week it is relatively quiet. Saul is a great host! 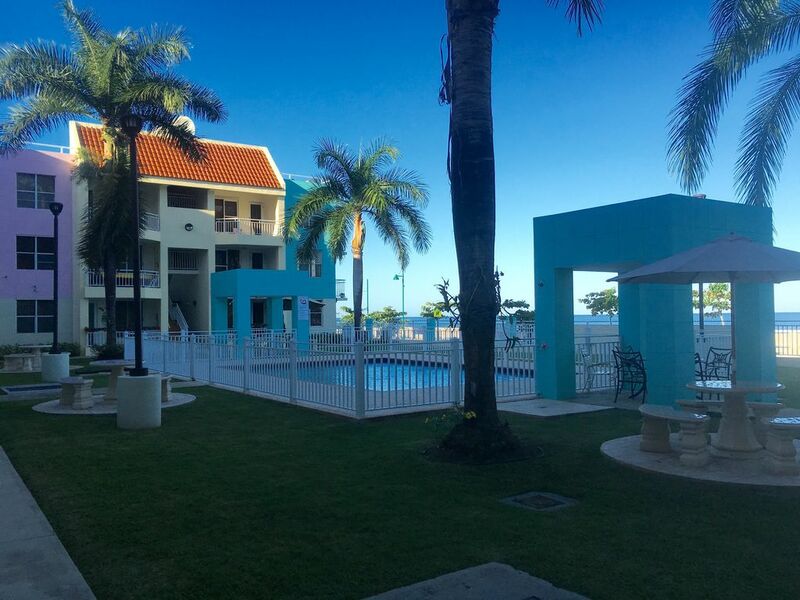 This condo was excellent with a perfect location and amazing views of the Aguadilla Bay. It is centrally located making it easy to walk every where from here. We enjoyed walking on the marina boardwalk, the beach and to different local restaurants in the area or simply sitting out on one of the balconies. Saul, the owner, was very attentive and courteous during the entire process. He quickly responded to all my texts and answered all of my questions. We are already planning our return trip for next year. We highly recommend this condo. The property at Vista Mar was simply beautiful. The photographs don't do the setting justice. This condominium was undoubedtly the best one in the complex. Since there are very few condominiums on the ocean in Aguidilla, this unit was one of the best in town as well! The sunsets were simply breathtaking. My daughter and I were there over Easter weekend so there was a lot of activity throughout the weekend. The street between the condominium and the promenade is quite busy, sort of a (much) smaller version of South Beach in Miami. There was quite a bit of street noise so if you desire solitude this might not be your best choice. There is no beach directly in front of the condo but Crash Boat and Punta Boniquen are very close (20 minutes and 30 minutes, respectively). Rincon is only 30 minutes away (if you take 115; 75 minutes if you take highway 2). The condominium was perfectly clean upon our arrival. The furnishings, while modest are in good condition. The beds were comfortable but the bedding was pretty dated. I hope to return to Aguidilla for business in the near future and plan to staying here again. This is a wonderful corner unit with amazing views. It is very close to restaurants and bars. There is lots to do in Aguadilla and the surrounding areas. We would definitely visit again and stay here. Thank you Saul. The condo has everything you need and is quite nice. Saul was always very helpful throughout the entire process; being quickly responsive whenever we had a question. There are two lovely decks that are the perfect spot to enjoy your morning coffee while watching the ocean across the street. The sound of the waves was lovely! I would recommend the condo to others. The location was convenient with easy access to the highway and walking distance to the local bars and restaurants. Everyone we encountered was friendly, helpful, and fun. The only drawback was the noise from the weekend action in town. Many locals come to the boardwalk area on the weekend to get out and have fun. There is a lot of loud music from cars driving by or coming from the bars. We are early risers and not night owls, so were disrupted in our normal routine. This is not an all night situation and it does quiet down later. If you are a night owl and like to be out and about in the festivities, you will love it. Please inquire about monthly rates and early arrivals.